Hello Monday! 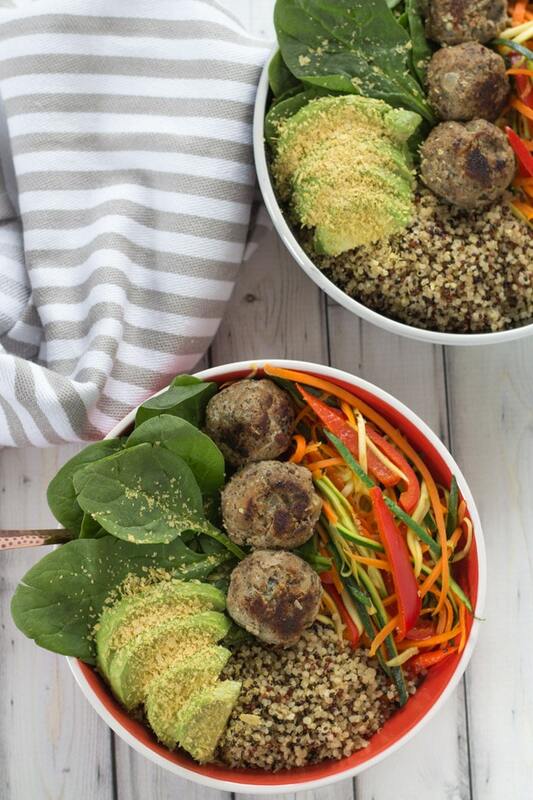 If you’ve had an indulgent weekend, please welcome this healthy Turkey Meatball Quinoa Bowl into your life! This is a clean eating bowl of honey, garlicky, protein goodness, and it is perfect for meal prepping on the weekend and enjoying the rest of the week (or at least until Tuesday)! I’ve been making this Turkey Meatball Quinoa Bowl a lot lately. Probably because I’ve been making these turkey meatballs all the time and trying them out in different recipes! They keep well in the freezer, and are quick and easy to defrost and serve on rice or quinoa, or even on top of a salad. Yep, I’ve been eating meatball salads. In the absence of cooked chicken or turkey in my fridge, and not wanting to open another can of tuna, I’ve been defrosting meatballs and adding them to my lunch salad. It is delish! While I’ve also used ground chicken in this recipe, I must admit, I prefer the texture of ground turkey. It just makes a firmer meatball. Whether you choose chicken or turkey, after mixing the meat with the honey, garlic, flax meal, and herbs, you should let it sit in the fridge overnight. This gives the flavours time to blend. I never really bought into this before, but I’ve made these meatballs a few times now without letting the mixture sit over night, and I could definitely taste a flavour difference. So once the meatballs have chilled and are cooking away in the frying pan, you can turn your attention to the rest of the Turkey Meatball Quinoa Bowl. First, the quinoa. I’ve only been eating quinoa for a year or so, and I’ll be honest, I find it a bit tricky. It always ends up mushy, never fluffy. But after doing a bit of research, I learned a few tricks! 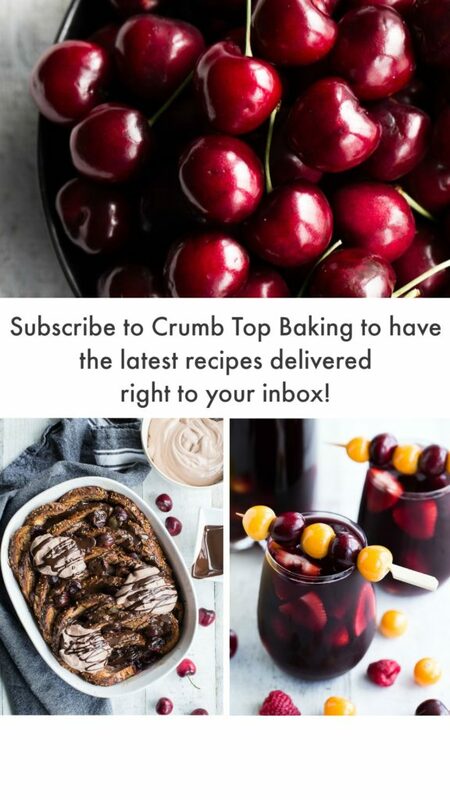 One – toast the quinoa first. Just add a little bit of olive oil to a frying pan and add the quinoa. Let it cook over a low heat for 5 minutes until the oil is absorbed. Be sure to keep an eye on it so it doesn’t burn or toast too much. Then just add the water (or, in this case, chicken stock) and let it cook for 15 minutes. Even though the liquid absorbs, the quinoa may still taste a little undercooked. Trick number 2? Remove the quinoa from the heat, keep it covered and let it sit for 5 minutes. Done! Fluffy quinoa. I know this is probably not new information for some of you, but for impatient folks like myself, these two tricks/tips are meal changing! Now, on to the exciting part (as if properly cooking quinoa wasn’t exciting enough!). After my Turkey and Prosciutto Zucchini Bake post, in which I referenced never trying a julienne peeler, I thought I would buy one and try it out. 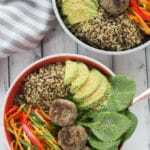 While it didn’t create noodles like my spiralizer, it was great for creating shredded and matchstick veggies, which was perfect for this Turkey Meatball Quinoa Bowl recipe. The julienne peeler worked well with the zucchini and carrot, but I gave up on the red pepper and just thinly sliced it with a knife. I sautéed this veggie mix for just a few minutes with olive oil, lemon juice, and salt and pepper. This was enough time for the veggies to heat up, but remain crunchy. 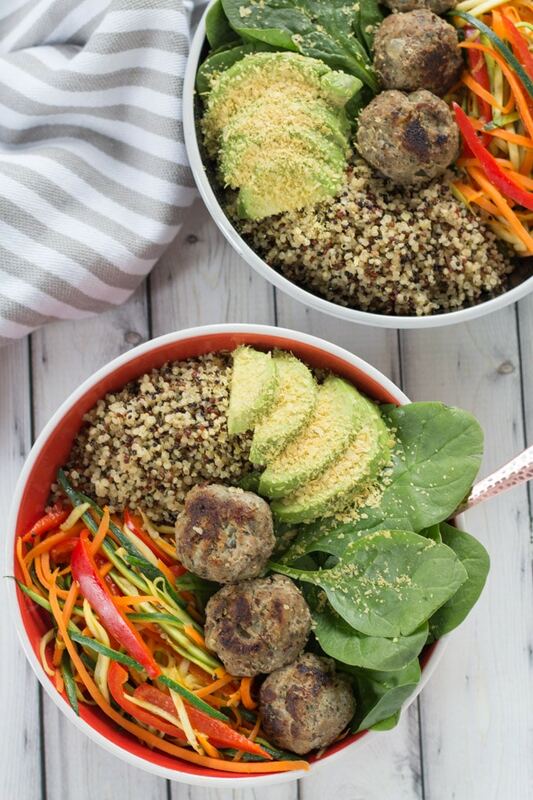 Exactly the right balance of texture needed for this Turkey Meatball Quinoa Bowl! Once the meatballs, quinoa and veggies are cooked, you can begin assembling the bowls. Don’t forget to add some spinach, sliced avocado and parmesan cheese! For the bowls pictured here, I actually added nutritional yeast instead of parmesan cheese, and it was really tasty. Nutritional yeast is a non-active yeast, with a somewhat cheesy taste. I read that you can add it to popcorn for flavour, so naturally, when I saw it at the supermarket, I had to buy it. And it’s a big tub, so in addition to this Turkey Meatball Quinoa Bowl, look for it in future recipes! Have you ever used nutritional yeast? If so, let me know what you’ve used it for. 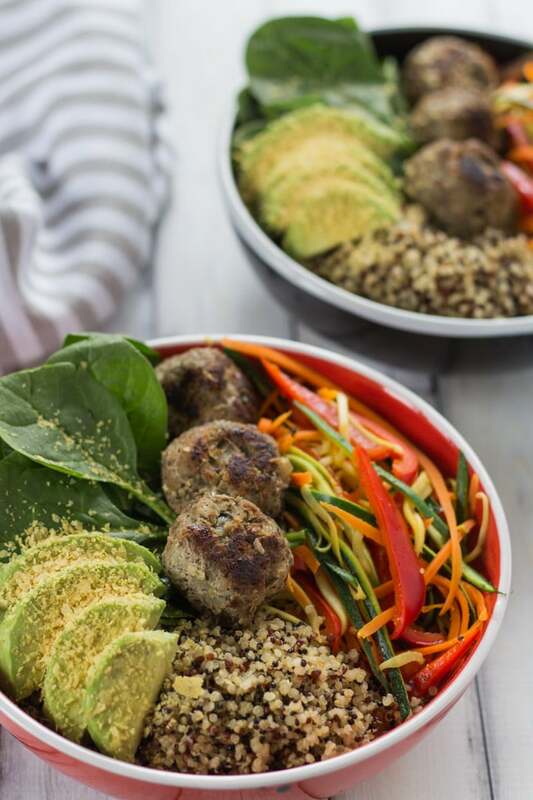 And if you make this Turkey Meatball Quinoa Bowl, especially the meatballs, let me know how it goes, and whether you like it with ground turkey or chicken. In a medium sized bowl, combine the turkey, garlic, herbs, onion, flax meal, honey, salt and pepper. Cover with plastic wrap or an airtight lid and place in the refrigerator overnight (or for at least 6-8 hours). Pre-heat a cast iron frying pan on low heat with a tbsp. of olive oil. Roll turkey mixture into 16 balls (about 1 1/2″ in diameter). Place in the frying pan and cover with a lid. (You can make the meatballs a bit smaller or bigger, just make sure to adjust the cooking time appropriately). Cook the meatballs on low heat for 15 minutes, or until the bottoms have browned. Turn the meatballs over, and continue cooking for another 10-15 minutes, or until fully cooked in the middle. 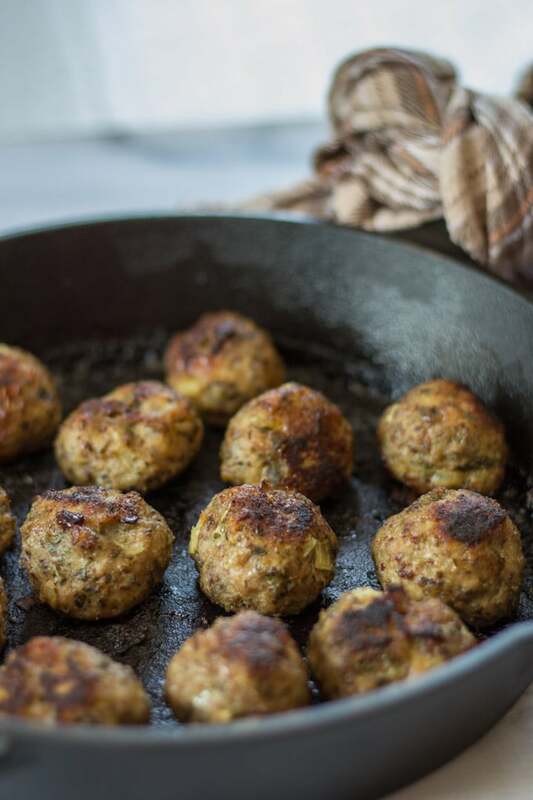 While the meatballs are cooking, add a tsp of olive oil to another frying pan and add the garlic. Let the garlic cook for 2 minutes and then add the quinoa. Toast the quinoa for 5 minutes, stirring frequently to ensure it doesn’t burn or toast too much. Then, add the chicken stock, herbs, and salt and pepper. Cover with a lid and bring to a boil. Once boiling, reduce heat and let quinoa cook for 15 minutes. Remove from heat and let sit for 5 minutes. 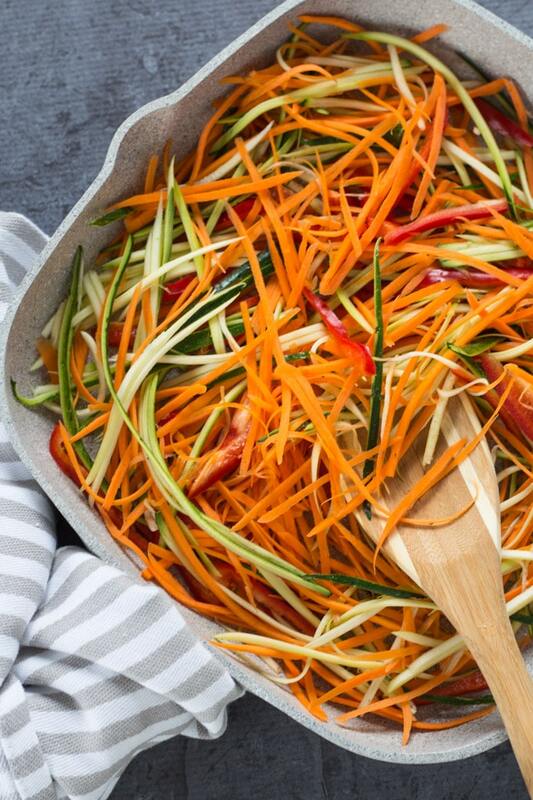 While the quinoa is sitting, use a julienne peeler or knife to cut the veggies into thin strips or matchsticks. Add to a frying pan (yep, another frying pan 🙂 ) with the olive oil and lemon juice. Season with a dash of salt and pepper. Cook on high for 2 minutes. Stir constantly to ensure the veggies do not burn. Split the quinoa and veggies into 4 small bowls (soup size) and then add some spinach. Add 3-4 meatballs to each bowl and top with sliced avocado and parmesan cheese or nutritional yeast. You can cook the meatballs in a covered dish in the oven, however, I find it easier and faster to cook them in a frying pan on the stove top. Covering the frying pan with a lid (or in my case, a baking sheet because I didn’t have a lid big enough) will trap the heat in and help the meatballs cook faster and more evenly.